Place quinoa in pie plate. Reserve 2 Tbsp. dressing for later use; brush remaining dressing onto both sides of fish fillets. 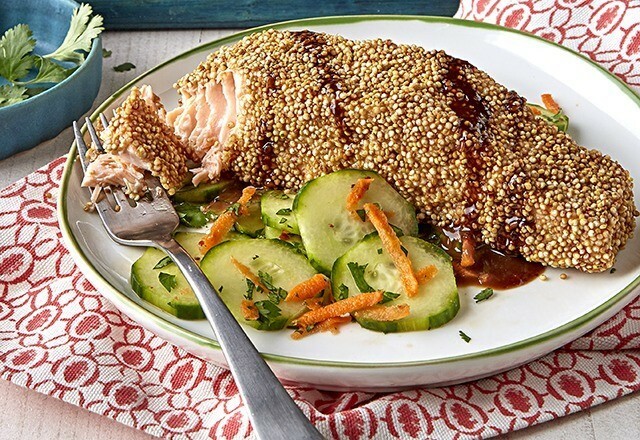 Dip fish, 1 fillet at a time, into quinoa, turning to evenly coat both sides of each fillet with quinoa. Place in single layer in shallow baking dish sprayed with cooking spray. Meanwhile, combine all remaining ingredients except reserved dressing. Drizzle fish with reserved dressing. Serve with cucumber mixture. Prep Time 30min. Total Time 30min.